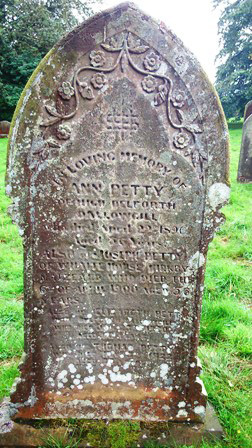 In Loving Memory of Ann Petty of High Belforth Dallowgill who died April 22nd 1896. Also of Joseph Petty of Whaite House Kirkby Malzeard who died the 6th of April 1900. Also of Elizabeth Petty of High Belforth Dallowgill who died January 23rd 1920. Also of Thomas Petty who died Nov 3rd 1922. Aged 80 years.